A multilateral arbitration panel in Washington, DC began final hearings Monday in a contentious and long-running dispute between an international mining company and the government of El Salvador. Washington – (IPS) – A multilateral arbitration panel here began final hearings Monday in a contentious and long-running dispute between an international mining company and the government of El Salvador. 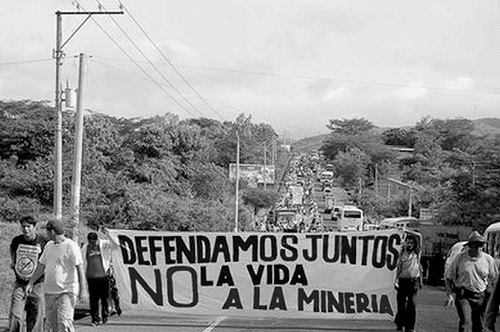 An Australian mining company, OceanaGold, is suing the Salvadoran government for refusing to grant it a gold-mining permit that has been pending for much of the past decade. El Salvador, meanwhile, cites national laws and policies aimed at safeguarding human and environmental health, and says the project would threaten the country’s water supply. The country also claims that OceanaGold has failed to comply with basic requirements for any gold-mining permitting. 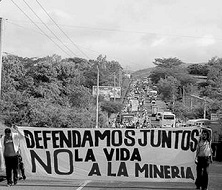 Further, in 2012, El Salvador announced that it would continue a moratorium on all mining projects in the country. Yet using a controversial provision in a free trade agreement, OceanaGold has been able to sue El Salvador for profits – more than 300 million dollars – that the company says it would have made at the goldmine. The case is being heard before the International Centre for the Settlement of Investment Disputes (ICSID), an obscure tribunal housed in the Washington offices of the World Bank Group. The OceanaGold project would involve a leaching process to recover small amounts of gold, using cyanide and, critics say, tremendous amounts of water. Those plans have made local communities anxious: the United Nations has already found that some 90 percent of El Salvador’s surface water is contaminated. On Monday, a hundred demonstrators rallied in front of the World Bank building, both to show solidarity with El Salvador against OceanaGold and to express their scepticism of the ICSID process more generally. The events coincided with El Salvador’s Independence Day. “We’re celebrating independence but what we’re really celebrating is dignity and the ability of every person to enjoy a good life, not only a few,” Father Eric Lopez, a Franciscan friar at a Washington-area church that caters to a sizable Salvadoran community, told IPS at the demonstration. The case’s jurisdictions are complicated and, for some, underscore the tenuousness of the ICSID’s arbitration process around the Salvador project. It was another mining company, the Canada-based Pacific Rim, that originally discovered a potentially lucrative minerals deposit along the Lempa River in 2002. The business-friendly Salvadoran government at the time (since voted out of power) reportedly encouraged the company to apply for a permit, though public concern bogged down that process. Frustrated by this turn of events, Pacific Rim filed a lawsuit against El Salvador under a provision of the Dominican Republic-Central American Free Trade Agreement (DR-CAFTA) that allowed companies to sue governments for impinging on their profits. While Canada, Pacific Rim’s home country, is not a member of DR-CAFTA, in 2009 the company created a subsidiary in the United States, which is. In 2012, ICSID ruled that the lawsuit could continue, pointing to a provision in El Salvador’s investment law. The country’s laws have since been altered to prevent companies from circumventing the national judicial system in favour of extra-national arbiters like ICSID. Last year, OceanaGold purchased Pacific Rim, despite the latter’s primary asset being the El Salvador gold-mining project, which has never been allowed to go forward. Although OceanaGold did not respond to a request for comment for this story, last year the company noted that it would continue with the arbitration case while also seeking “a negotiated resolution to the … permitting impasse”. For its part, the Salvadoran government says it has halted the permitting process not only over environmental and health concerns but also over procedural matters. While these include Pacific Rim’s failure to abide by certain reporting requirements, the company also appears not to have gained important local approvals. Under Salvadoran law, an extractive company needs to gain titles, or local permission, for any lands it wants to develop. Yet Pacific Rim had such access to just 13 percent of the lands covered by its proposal, according to Oxfam America, a humanitarian and advocacy group. 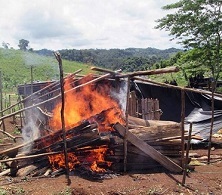 Given this lack of community support in a country with recent history of civil unrest, some warn that an ICSID decision in OceanaGold’s favour could result in violence. “This mining project was re-opening a lot of the wounds that existed during the civil war, and telling a country that they have to provoke a civil conflict in order to satisfy investors is very troublesome,” Luke Danielson, a researcher and academic who studies social conflict around natural resource development, told IPS. Bilateral and regional investment treaties such as DR-CAFTA have seen massive expansion in recent years. And increasingly, many of these include so-called “investor-state” resolution clauses of the type being used in the El Salvador case. Currently some 2,700 agreements internationally have such clauses, ICSID reports. Meanwhile, although the tribunal has existed since the 1960s, its relevance has increased dramatically in recent years, mirroring the rise in investor-state clauses. ISCID itself doesn’t decide on how to resolve such disputes. Rather, it offers a framework under which cases are heard by three external arbiters – one appointed by the investor, one by the state and one by both parties. Yet outside of the World Bank headquarters on Monday, protesters expressed deep scepticism about the highly opaque ISCID process. Several said that past experience has suggested the tribunal is deeply skewed in favour of investors. “This is a completely closed-door process, and this has meant that the tribunal can basically do whatever it wants,” Carla Garcia Zendejas director of the People, Land & Resources program at the Center for International Environmental Law, a watchdog group here, told IPS. Zendejas says the rise in investor-state lawsuits in recent years has resulted in many governments, particularly in developing countries, choosing to acquiesce in the face of corporate demand. Litigation is not only cumbersome but extremely expensive. “Governments are increasingly wary of being sued, and therefore are more willing to accept and change polices or to ignore their own policies, even if there’s community opposition,” she says. While there is no public timeframe for ISCID resolution on the El Salvador case, a decision is expected by the end of the year.